Dr Kush Tripathi is a fellowship trained interventional pain physician and board certified anesthesiologist. Dr Tripathi graduated from the University of Missouri - Kansas City in their accelerated combined BA/MD program. He successfully completed his anesthesiology residency at Rush University Medical Center in Chicago, IL and subsequently, he went to the University of North Carolina for his fellowship in pain management. Dr Tripathi specializes in the management of chronic pain with a focus on interventional techniques. In training, he focused on management of neck and back pain, peri-operative pain, and complex regional pain syndrome (CRPS). Dr Tripathi has a strong passion for sports medicine and is proficient in joint disease evaluation, management, and treatment. He has presented several abstracts at national conferences and has received awards for his work in anesthesia and pain research. 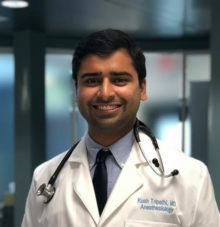 Dr Tripathi was born and raised in Detroit, MI. He grew up playing soccer, basketball, running, and watching Michigan football. In Chicago, he became a foodie and fine dining connoisseur. In his free time, he enjoys traveling and outdoor activities. He is married and recently relocated to the Fort Lauderdale area. Dr Tripathi is a part of the South Florida surgical group and Broward Specialty Center, but practices independently. North American Neuromodulation Society (NANS).